In order to cater the variegated demands of our clients, we are offering an excellent quality range of Clay Graphite Carbon Crucible. 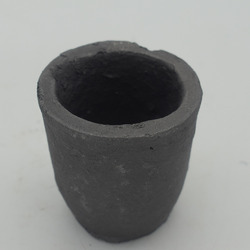 Our Graphite Clay Crucible is used for various foundries of non ferrous metals zinc, lead, aluminum, brass, copper etc. where there are temperature ranges between 700 to 1400° C.
- Available in Shapes "A" for capacities of 0.09 Kgs to 239 Kgs. John & Mani India Pvt. Ltd.
We offer Clay Graphite Crucibles, which are used for melting and casting of precious metals. These crucibles are available in B-shape/BU-shape and brimful capacity of 100 kg to 1300 kg of aluminum. Offered in sizes ranging from 100 to 1300, these are known for their features like chemical & corrosion resistance, low maintenance and low permeability. To cater the variegated needs of our esteemed customers, we are highly engaged in offering a wide array of Clay Graphite Crucibles. Clay graphite ingate sleeves manufactured by zircar crucibles has got approval by rail wheel factory, bangalore, india. Clay graphite tubes of different shapes can also be made on request. Engaged in manufacturing and supplying all kinds of clay graphite crucibles. Rajesh trading corporation - established dealer , associated with the metals industry. Prominent dealer of crucible in the foundry industry. • The dimensions shown are nominal and subject to normal manufacturing tolerances. 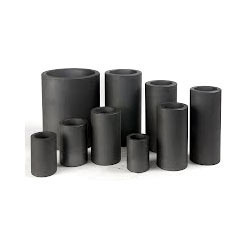 Exporters of all types of Silicon Carbide & Clay Graphite Crucibles. Crucibles for over all lift and. In TPI-SHAPE' crucibles are available in sizes from TPI- 4 to TPI-10 having a brimful capacity of 200 kgs to 500 kgs of Zinc.